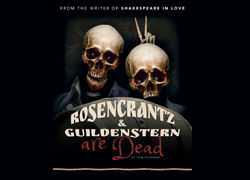 Against the backdrop of Hamlet, this mind-bending situation comedy sees two hapless minor characters, Rosencrantz and Guildenstern, take centre stage. Increasingly bewildered and out of their depth, this hilarious double act stumble their way in and out of the action of Shakespeare's iconic drama. A brilliantly funny comedy about the ultimate identity crisis.